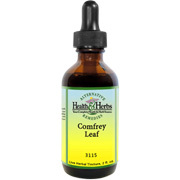 COMFREY LEAF (Symphytum officinale) One of the most well-known healing plants, especially for its ability to heal tissue and bone (due to its allantoin content, which promotes the growth of connective tissue, bone, and cartilage, and is easily absorbed through the skin). Also used externally for varicose ulcers and veins and minor burns. A beneficial remedy for respiratory disorders, gastric ulcers, and colitis. Considered an overall tonic; good for the stomach, liver, kidneys, and bowels. Other indications: mental fatigue, cramps in the legs, coughs, colds, anemia, pain, arthritis, and infections. Combinations: For urinary tract infections it may be used with Buchu, Bearberry or Yarrow. It can be combined with Hydrangea for prostrate problems. Preparations & Dosage: Decoction: put 2 teaspoonfuls of the cutrhizome in a cup of water, bring to boiling and let simmer for l0 minutes. This should be drunk three times a day. Tincture: take 2-4 ml of the tincture three times a day. Heals tissues and bones, use externally for varicose veins, and minor burns. Helps respiratory complaints and bleeding. Comfrey Leaf, R/O Water, 12% Alcohol. Comfrey Leaf is shipped in a discrete, unmarked package. Orders are processed immediately and usually take about 3 to 5 working days to be received. Any information received is used only for order processing and shipping purposes. Your information, such as e-mail address, will never be disclosed to a third party.